When we cooked together at the beginning of our relationship, my husband would make fun of my habit of leaving the wooden stirring spoon in the dish while it cooked, asking jokingly if that was the special ingredient that would make it really good. One day, back at my parents’ house for holidays, I spotted the wooden spoon resting in the simmering sauce my mum was cooking. I smiled and pointed it to my husband, recognizing now where that particular habit came from. When cooking in different countries or with other people, you come to notice your culinary habits, the way you cut or prepare the food, the very products you use. Then you can challenge them and try something new, like an unfamiliar ingredient or a different style of preparation. If you ask me why I’m not familiar with pumpkin, I’d tell you that it is simply because I never ate it at home as a kid. My parents do not happen to cook pumpkin, probably because their parents never served it either. So when I ate wedges of oven-baked pumpkin grown on the roof of the Student center in Zagreb, it was a total discovery for me. All those years spent in ignorance of that melting texture, of that bright orange color, of that delicate flavor which reminds me of hazelnut… Something had to be done. I biked to Dolac, got a butternut squash, then hit the Web and ended up trying a really easy and tasty recipe of oven-baked squash. I got my second squash with the idea to experiment. 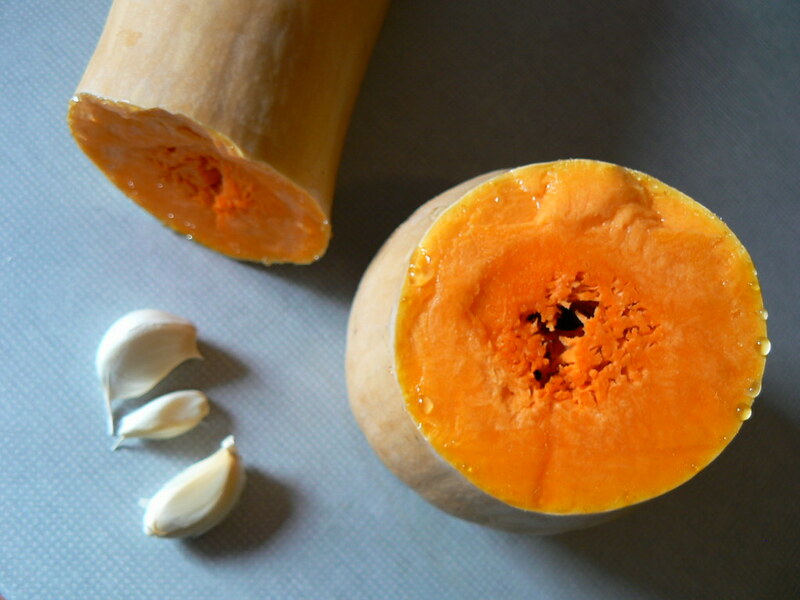 I had seen a risotto where pumpkin was paired with walnut and many recipes for the pumpkin pie American movies have made familiar, but I was thinking soup, because that’s one of my favorite foods: it is delicious and healthy, easy to prepare, and it offers endless possibilities of combination. 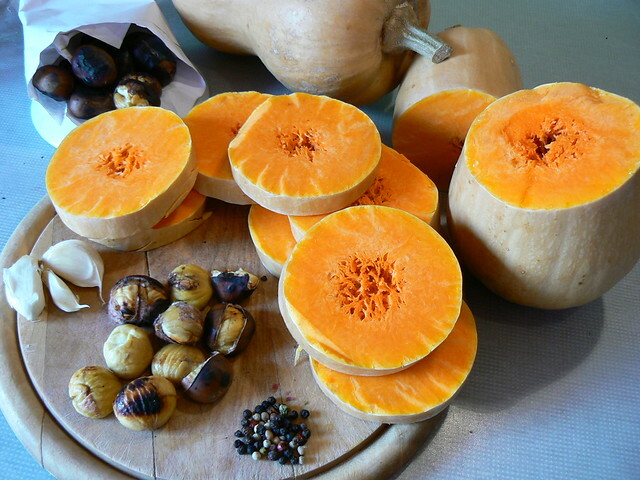 There I was in the kitchen, butternut squash in hand, plunging mixer to the ready: so what goes in that soup? Springing to my mind first, my all-time ingredient that goes with everything else and whose flavor I seldom ignore when cooking: garlic. Ok, what else? That’s when I got inspired by the bright autumn day outside the window. Zagreb is so beautiful during that season, I think because the color of the leaves, still on the trees or in big heaps on the ground, complements nicely the yellow building and their dark orange roofs. And what pops up at every street corner in autumn in Zagreb, just like the strawberries stalls do at the end of spring? Yes, roasted chestnuts carts! So I went to the closest one to pick a cornet, went back home and cooked a rich and flavorful soup perfect for the autumn weather that inspired it. Peel and dice the garlic and squash. Pour some oil in a big pot and start frying the garlic and squash on high fire. Add salt and stir well to coat them with oil. After 5 minutes, lower the fire to the minimum, cover with a lid and let the mix “sweat” for about 10 minutes (you can even switch to smaller burner to make sure the vegetables don’t burn). Check and stir from time to time: the vegetables must let their water out and become soft. In my opinion, this step is really important, as it allows the flavors to develop and your soup to be more than just vegetables cooked in water. Cover with water, turn the fire back on high to bring to a boil. Then lower the fire and let the soup simmer for 15 minutes or until the squash is completely cooked. During that time you can peel the chestnuts. Be careful to remove the husk entirely so that they are not bitter. If they are cold, you can reheat them in a pan so that they are easier to peel. Add the chestnuts to the soup and mix it with the plunging mixer until it’s completely smooth. Adding roasted chestnuts will make the soup thicker: if you find it too thick, add some water. This trick works equally well with a carrot or a mushroom soup. Serve topped with roasted pumpkin seeds, along slices of bread.